6073 NW 6073 NW 02-1975 75622 75622-1 Equipped with A/C, electric handbrake. 6074 NW 6074 NW 02-1975 75622 75622-2 Equipped with A/C, electric handbrake. 6075 NW 6075 NW 02-1975 75622 75622-3 Equipped with A/C, electric handbrake. 6076 NW 6076 NW 02-1975 75622 75622-4 Equipped with A/C, electric handbrake. 6077 NW 6077 NW 02-1975 75622 75622-5 Equipped with A/C, electric handbrake. 6078 NW 6078 NW 02-1975 75622 75622-6 NS LEADER/PTC Equipped. Equipped with A/C, electric handbrake. 6079 NW 6079 NW 02-1975 75622 75622-7 Equipped with A/C, electric handbrake. 6080 NW 6080 NW 02-1975 75622 75622-8 Equipped with A/C, electric handbrake. 6081 NW 6081 NW 02-1975 75622 75622-9 Equipped with A/C, electric handbrake. 6082 NW 6082 NW 02-1975 75622 75622-10 Equipped with A/C, electric handbrake. 6083 NW 6083 NW 03-1975 75622 75622-11 Equipped with A/C, electric handbrake. 6084 NW 6084 NW 03-1975 75622 75622-12 Equipped with A/C, electric handbrake. 6085 NW 6085 NW 03-1975 75622 75622-13 Equipped with A/C, electric handbrake. 6086 NW 6086 NW 03-1975 75622 75622-14 Equipped with A/C, electric handbrake. 6087 NW 6087 NW 03-1975 75622 75622-15 Equipped with A/C, electric handbrake. 6088 NW 6088 NW 03-1975 75622 75622-16 Equipped with A/C, electric handbrake. 6089 NW 6089 NW 03-1975 75622 75622-17 Equipped with A/C, electric handbrake. Unit currently stored, but still on the active roster. 6090 NW 6099 NW 03-1975 75622 75622-18 Equipped with A/C, electric handbrake. 6091 NW 6091 NW 03-1975 75622 75622-19 Equipped with A/C, electric handbrake. 6092 NW 6092 NW 03-1975 75622 75622-20 Equipped with A/C, electric handbrake. See additional note below. 6093 NW 6093 NW 03-1975 75622 75622-21 Equipped with A/C, electric handbrake. 6094 NW 6094 NW 03-1975 75622 75622-22 Equipped with A/C, electric handbrake. Unit currently stored, but still on the active roster. 6095 NW 6095 NW 03-1975 75622 75622-23 Equipped with A/C, electric handbrake. 6096 NW 6096 NW 03-1975 75622 75622-24 Equipped with A/C, electric handbrake. 6097 NW 6097 NW 03-1975 75622 75622-25 Equipped with A/C, electric handbrake. 6098 NW 6098 NW 03-1975 75622 75622-26 Equipped with A/C, electric handbrake. 6099 NW 6099 NW 03-1975 75622 75622-27 Equipped with A/C, electric handbrake. 6100 NW 6100 NW 05-1975 75622 75622-28 Equipped with A/C, electric handbrake. 6101 NW 6101 NW 05-1975 75622 75622-29 Equipped with A/C, electric handbrake. 6102 NW 6102 NW 05-1975 75622 75622-30 Equipped with A/C, electric handbrake. 6103 NW 6103 NW 05-1975 75622 75622-31 Equipped with A/C, electric handbrake. 6104 NW 6104 NW 05-1975 75622 75622-32 Equipped with A/C, electric handbrake. 6105 NW 6105 NW 05-1975 75622 75622-33 Equipped with A/C, electric handbrake. 6106 NW 6106 NW 05-1975 75622 75622-34 Equipped with A/C, electric handbrake. 6107 NW 6107 NW 05-1975 75622 75622-35 NS LEADER/PTC Equipped. 6108 NW 6108 NW 05-1975 75622 75622-36 Equipped with A/C, electric handbrake. 6109 NW 6109 NW 05-1975 75622 75622-37 Equipped with A/C, electric handbrake. 6110 NW 6110 NW 05-1975 75622 75622-38 Equipped with A/C, electric handbrake. 6111 NW 6111 NW 05-1975 75622 75622-39 NS LEADER/PTC Equipped. 6112 NW 6112 NW 05-1975 75622 75622-40 Equipped with A/C, electric handbrake. 6113 NW 6113 NW 05-1975 75622 75622-41 NS LEADER/PTC Equipped. 6114 NW 6114 NW 05-1975 75622 75622-42 Equipped with A/C, electric handbrake. 6115 NW 6115 NW 05-1975 75622 75622-43 NS LEADER/PTC Equipped. 6116 NW 6116 NW 05-1975 75622 75622-44 Equipped with A/C, electric handbrake. 6117 NW 6117 NW 05-1975 75622 75622-45 Equipped with A/C, electric handbrake. 6118 NW 6118 NW 05-1975 75622 75622-46 Equipped with A/C, electric handbrake. 6119 NW 6119 NW 05-1975 75622 75622-47 Equipped with A/C, electric handbrake. 6120 NW 6120 NW 05-1975 75622 75622-48 Equipped with A/C, electric handbrake. Unit currently stored, but still on the active roster. 6121 NW 6121 NW 05-1975 75622 75622-49 Equipped with A/C, electric handbrake. 6122 NW 6122 NW 05-1975 75622 75622-50 Equipped with A/C, electric handbrake. 6123 NW 6123 NW 05-1975 75622 75622-51 Equipped with A/C, electric handbrake. 6124 NW 6124 NW 05-1975 75622 75622-52 Equipped with A/C, electric handbrake. 6125 NW 6125 NW 05-1975 75622 75622-53 Equipped with A/C, electric handbrake. 6126 NW 6126 NW 05-1975 75622 75622-54 Equipped with A/C, electric handbrake. 6127 NW 6127 NW 05-1975 75622 75622-55 Equipped with A/C, electric handbrake. 6128 NW 6128 NW 05-1975 75622 75622-56 Equipped with A/C, electric handbrake. 6129 NW 6129 NW 05-1975 75622 75622-57 Equipped with A/C, electric handbrake. 6130 NW 6130 NW 05-1975 75622 75622-58 Equipped with A/C, electric handbrake. Unit currently stored, but still on the active roster. 6131 NW 6131 NW 05-1975 75622 75622-59 Equipped with A/C, electric handbrake. 6132 NW 6132 NW 05-1975 75622 75622-60 Equipped with A/C, electric handbrake. 6133 NW 6133 NW 05-1975 75622 75622-61 Equipped with A/C, electric handbrake. 6135 NW 6135 NW 05-1975 75622 75622-63 Equipped with A/C, electric handbrake. 6136 NW 6136 NW 05-1975 75622 75622-64 Equipped with A/C, electric handbrake. 6137 NW 6137 NW 05-1975 75622 75622-65 Equipped with A/C, electric handbrake. 6138 NW 6138 NW 05-1975 75622 75622-66 Equipped with A/C, electric handbrake. Unit currently stored, but still on the active roster. 6139 NW 6139 NW 05-1978 776086 776086-1 Equipped for remote control operation. 6140 NW 6140 NW 05-1978 776086 776086-2 Equipped for remote control operation. 6141 NW 6141 NW 05-1978 776086 776086-3 Equipped for remote control operation. 6142 NW 6142 NW 05-1978 776086 776086-4 Equipped for remote control operation. 6143 NW 6143 NW 05-1978 776086 776086-5 Equipped for remote control operation. 6144 NW 6144 NW 05-1978 776086 776086-6 Equipped for remote control operation. 6145 NW 6145 NW 05-1978 776086 776086-7 Equipped for remote control operation. 6146 NW 6146 NW 05-1978 776086 776086-8 Equipped for remote control operation. 6147 NW 6147 NW 05-1978 776086 776086-9 Equipped for remote control operation. 6148 NW 6148 NW 05-1978 776086 776086-10 Equipped for remote control operation. 6149 NW 6149 NW 05-1978 776086 776086-11 Equipped for remote control operation. Unit currently stored with wreck damage. 6150 NW 6150 NW 05-1978 776086 776086-12 Equipped for remote control operation. 6151 NW 6151 NW 05-1978 776086 776086-13 Equipped with A/C, electric handbrake. Equipped for remote control operation. Equipped with LED front and rear headlights. 6152 NW 6152 NW 05-1978 776086 776086-14 Equipped with A/C, electric handbrake. Equipped for remote control operation. 6153 NW 6153 NW 05-1978 776086 776086-15 Equipped with A/C, electric handbrake. Equipped for remote control operation. 6155 NW 6155 NW 05-1978 776086 776086-17 Equipped with A/C, electric handbrake. 6156 NW 6156 NW 05-1978 776086 776086-18 Equipped with A/C, electric handbrake. See additional note below. 6157 NW 6157 NW 05-1978 776086 776086-19 Equipped with A/C, electric handbrake. 6158 NW 6158 NW 05-1978 776086 776086-20 Equipped with A/C, electric handbrake. Unit currently stored, but still on the active roster. 6159 NW 6159 NW 05-1978 776086 776086-21 Equipped with A/C, electric handbrake. 6160 NW 6160 NW 05-1978 776086 776086-22 Equipped with A/C, electric handbrake. 6161 NW 6161 NW 05-1978 776086 776086-23 Equipped with A/C, electric handbrake. 6162 NW 6162 NW 05-1978 776086 776086-24 Equipped with A/C, electric handbrake. 6163 NW 6163 NW 05-1978 776086 776086-25 NS LEADER/PTC Equipped. 6164 NW 6164 NW 06-1978 776086 776086-26 Equipped with A/C, electric handbrake. 6165 NW 6165 NW 06-1978 776086 776086-27 Equipped with A/C, electric handbrake. Equipped for remote control operation. 6166 NW 6166 NW 06-1978 776086 776086-28 Equipped with A/C, electric handbrake. 6167 NW 6167 NW 06-1978 776086 776086-29 Equipped with A/C, electric handbrake. 6168 NW 6168 NW 06-1978 776086 776086-30 Equipped with A/C, electric handbrake. 6169 NW 6169 NW 06-1978 776086 776086-31 Equipped with A/C, electric handbrake. 6170 NW 6170 NW 06-1978 776086 776086-32 Equipped with A/C, electric handbrake. 6171 NW 6171 NW 06-1978 776086 776086-33 Equipped with A/C, electric handbrake. 6172 NW 6172 NW 06-1978 776086 776086-34 Equipped with A/C, electric handbrake. Unit currently stored, but still on the active roster. 6174 NW 6174 NW 06-1978 776086 776086-36 Equipped with A/C, electric handbrake. 6175 NW 6175 NW 06-1978 776086 776086-37 Equipped with A/C, electric handbrake. Equipped for remote control operation. 6176 NW 6176 NW 06-1978 776086 776086-38 Equipped with A/C, electric handbrake. 6177 NW 6177 NW 06-1978 776086 776086-39 Equipped with A/C, electric handbrake. 6178 NW 6178 NW 06-1978 776086 776086-40 Equipped with A/C, electric handbrake. 6179 NW 6179 NW 06-1978 776086 776086-41 Equipped with A/C, electric handbrake. 6180 NW 6180 NW 06-1978 776086 776086-42 Equipped with A/C, electric handbrake. 6181 NW 6181 NW 06-1978 776086 776086-43 Equipped with A/C, electric handbrake. 6182 NW 6182 NW 06-1978 776086 776086-44 Equipped with A/C, electric handbrake. 6183 NW 6183 NW 06-1978 776086 776086-45 Equipped with A/C, electric handbrake. 6184 NW 6184 NW 06-1978 776086 776086-46 Equipped with A/C, electric handbrake. 6185 NW 6185 NW 06-1978 776086 776086-47 Equipped with A/C, electric handbrake. 6186 NW 6186 NW 06-1978 776086 776086-48 Equipped with A/C, electric handbrake. 6187 NW 6187 NW 06-1978 776086 776086-49 Equipped with A/C, electric handbrake. 6188 NW 6188 NW 06-1978 776086 776086-50 Equipped with A/C, electric handbrake. 6189 NW 6189 NW 12-1980 796353 796353-1 Equipped with A/C, electric handbrake. 6190 NW 6190 NW 12-1980 796353 796353-2 Equipped with A/C, electric handbrake. 6191 NW 6191 NW 12-1980 796353 796353-3 Equipped with A/C, electric handbrake. 6192 NW 6192 NW 12-1980 796353 796353-4 Equipped with A/C, electric handbrake. 6193 NW 6193 NW 12-1980 796353 796353-5 Equipped with A/C, electric handbrake. 6194 NW 6194 NW 12-1980 796353 796353-6 Equipped with A/C, electric handbrake. 6195 NW 6195 NW 12-1980 796353 796353-7 Equipped with A/C, electric handbrake. 6196 NW 6196 NW 12-1980 796353 796353-8 Equipped with A/C, electric handbrake. 6197 NW 6197 NW 12-1980 796353 796353-9 Equipped with A/C, electric handbrake. 6198 NW 6198 NW 12-1980 796353 796353-10 Equipped with A/C, electric handbrake. 6199 NW 6199 NW 12-1980 796353 796353-11 Equipped with A/C, electric handbrake. 6200 NW 6200 NW 12-1980 796353 796353-12 Equipped with A/C, electric handbrake. Unit currently stored, but still on the active roster. 6201 NW 6201 NW 12-1980 796353 796353-13 Equipped with A/C, electric handbrake. 6202 NW 6202 NW 12-1980 796353 796353-14 Equipped with A/C, electric handbrake. Equipped for remote control operation. 6203 NW 6203 NW 12-1980 796353 796353-15 Equipped with A/C, electric handbrake. Equipped for remote control operation. 6204 NW 6204 NW 12-1980 796353 796353-16 Equipped with A/C, electric handbrake. 6205 NW 6205 NW 12-1980 796353 796353-17 Equipped with A/C, electric handbrake. 6206 NS 3821 NS 6206 NW 6206 NW 12-1980 796353 796353-18 Equipped with A/C, electric handbrake. See note below for further information on the history of this unit. Units 6177-6206 are equipped to operate as slug masters with NS RPU6 slugs. 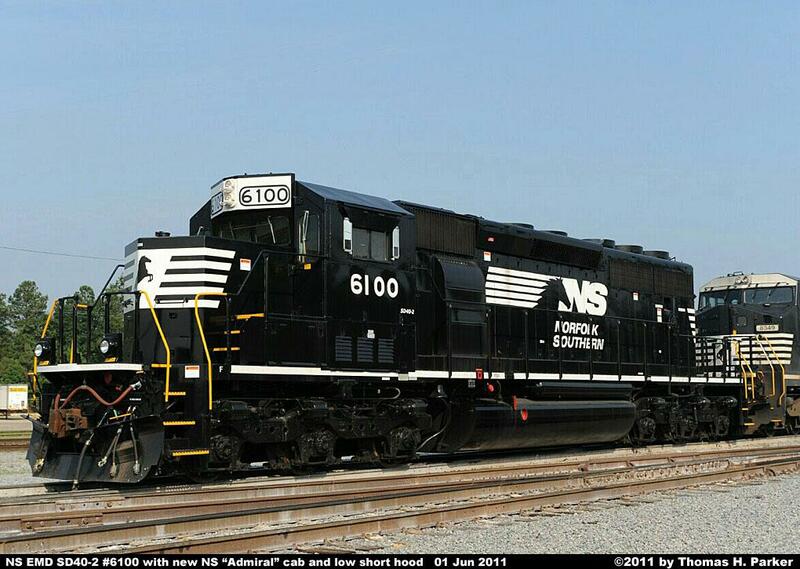 Unit 6092 was upgraded 01/2013 with Interstate Electronic Fuel Injection (EFI) and NS-designed split cooling system. It was overhauled 09-2016 and both the Interstate EFI and NS split cooling system were removed. added to the long hood end pilot for HEP/stand-by power use. 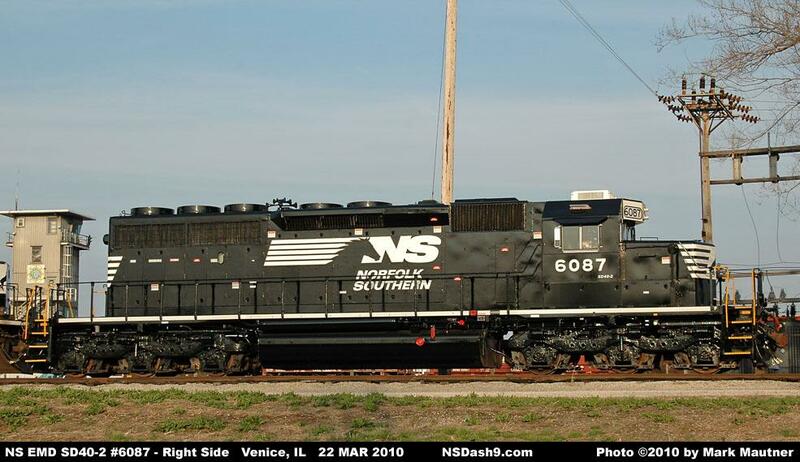 Unit 6206 was rebuilt in 2004 as a 2,000 horsepower SD38-2 and was renumbered as NS 3821. 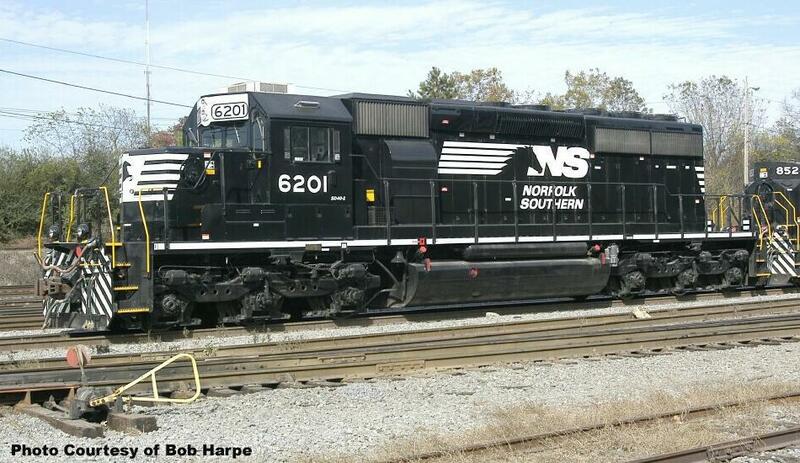 NS converted the 3821 back to an SD40-2 in May 2013 and restored its original number of 6206.